Ryan Suszek will transition in April from Besser vice president of Pipe and Precast to president, succeeding Kevin Curtis and becoming the sixth individual to hold the title in the manufacturer’s 115-year history. “I could not be more pleased with the Board’s decision,” says Curtis, who remains chief executive officer. “Ryan has proven himself to be a very capable leader and we’re all excited to see his role expand.” The Pipe and Precast tenure has provided valuable leadership experience and comprehensive knowledge of the concrete products industry, he adds. 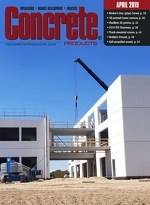 “The concrete products industry provides countless opportunities for collaboration and growth. I’m excited to lead the team at Besser in operational improvements and work closely with producers to create new and grow existing partnerships,” Suszek affirms.